Urgent Care or the Emergency Room? - Bond Clinic, P.A. Bond Clinic, P.A. 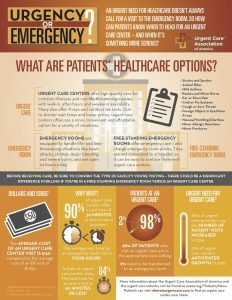 When to use Urgent Care versus the Emergency Room can be very confusing. An injury or sudden illness can put anyone in the mindset that it must be treated immediately, but knowing the differences between the two treatment centers can mean a big difference between how much of your time and money is spent. Let’s first look at which is what. Urgent Care covers all the typical ailments that your primary may treat. This can include cold and flu, minor cuts, ear pain, fever, and mild burns. The perfect place for not life threatening instances. Also, it is a great option if your primary doctor is booked. The ER is where you want to go for more immediate life threatening injuries. Emergency departments are equipped to handle everything and especially the bigger problems. This can include head and spinal injuries, uncontrollable bleeding, sudden vision loss, and severe burns. When in doubt this is your go to place, and your ER is available 24/7 year round. Now that we have a basic overview of the two, let’s review the benefits when compared. Spoiler alert, Urgent Care wins in almost all categories. According to the Urgent Care Association of America the average Urgent Care visitor waits 30 minutes or less to be seen by their provider while a patient could potentially wait more than a couple hours. The cost can also vary greatly where patients could spend seven times as much in the ER versus the Urgent Care. Refer to the handy UCAOA infographic for a full breakdown. Bond Clinic Urgent Care is great for all of your minor illnesses and injuries, as well as non-injury items. Urgent Care is open to both established Bond Clinic patients and the general public. Most major insurance and cash pay patients are accepted. No appointments necessary and walk-ins are welcome!